We all remember Venice at the time of Botero exhibition. In preset positions, as if by magic, giant sculptures were showed, perhaps worrying at the beginning, but becoming gradually familiar to us up to think, at the end of the exhibition, it was a pity that they were no more here. Of course, the clash between the city made of water and gold reflections, quite a mirage, and the dark matter, shaped into firm forms that in Botero's works quite transcend the human nature, could have worried everyone else, but not Stefano Contini, who challenged and won. Botero's works, exhibited in Venice, have acted on our mind for making themselves acceptable and recognisable as "other" when compared with the architectural and figurative culture of the city; not only when they were showed in Venice, but also now when they are elsewhere, we have been realizing they are still working enriching us with new emotions and strengthening the awareness of this unique, Venice. On the last June 16th Contini opened a one-man Botero exhibition in Rome at Palazzo Venezia and in this marble city, already full of statues, the internal area of a palace was devoted to paintings done in the last 15 years of his life. Stefano Contini loves giant spaces and art playing with them very well. He loves life, people and his job and approaches all them joyfully. This first impression was confirmed on our arrival at his art gallery in Venice, in "Calle dello Spezier", near "Campo S. Stefano". The oldest part develops on two levels while the most recent one overlooks the external cloister where marvellous sculptures by Chia, Botero and Mitoraj stand, in all about 650 sm. Mr. Contini, we know you love yachts and sea... and art naturally. Where are you come from originally? I was born in Pistoia of parents from Livorno; now I live in Venice and love the lagoon. I confess you I yearn for a 7 or 8 metre boat, mainly to go and eat "on the isle" with my friends, but although this is an "venezianissima" aspiration, it's very hard to found berths in the city: I hope I can realize this dream as soon as possible, since moving around isles is the quintessence of the Venetian being, the "joie de vivre" the lagoon which emerges in Canaletto's paintings. 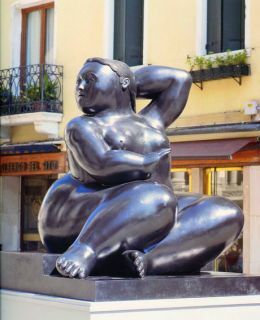 Would you, please, remind me Botero in Venice? Yes, of course. 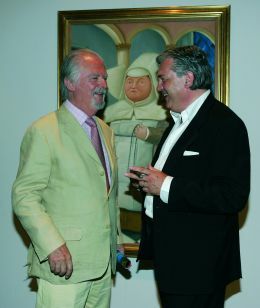 In 2003 I proposed the exhibition to the local government and the idea was successfully accepted: Botero's paintings were showed at "Palazzo Ducale", while right 20 sculptures were set everywhere in the city. Why did a Tuscan settle in Venice? Well, I love Venice and right 31 years ago I decided to move to, even though I was greatly aware to come from my native, magnificent Tuscany. However, Venice is greatly able to absorb whichever kind of experience, artistic or not. What do you think about controversies upon "Octopus" that, 126 metres in length, is one of the biggest yachts in the world? Well, I think we must wipe out whichever criticism by the current economic crisis. We hear always of recession, competitiveness, PIL decreasing to zero, so in this hard days, indeed I find we should lay a carpet of flower on the water for all superyachts arriving at Venice, hoping that more and more will come to . or do we want to wait a bit more . and loose a precious opportunity? We must remember the great richness of Venice is doubtlessly the first - rate tourism. These yachts bring a great deal of visitors being among the owner's suite, and this entire people spend a lot of money in hotels and stores producing so an induced activity that brings wealth. Indeed, the actual problem in Venice is a lack of berths right made for these yachts. I think the local government should work night and day to realize them, above all in a city with a casino. How do you judge the quality of these luxury objects defined by the local press as "squat and clumsy objects"? Well, I think the impressive interior and exterior design and the high advanced technology make them actually works of art. I have often seen yachts masterly designed and built, and it's natural that customers relied on great professional persons for them. At the same time I seemed to have seen that, when someone has got down to the art, the results of have often been worse than expected and it happened not because of a lack of culture or taste, but because an owner relied to an extemporary person or to someone not able to artistically decor a yacht. Owners are sure masterminds in so far they want to benefit from great shipyards as well as they usually turn to great doctors, lawyers and business consultants, but they often forget the life quality depends on the chance of being surrounded with beautiful, first - rate things, so with works of art too. How would you approach an owner who would put works of art on board? Well, as a professional consultant I should speak with him and ask about his artistic taste (period, style and subjects). A work of art is put on board to last after the building ends and a skilled art consultant should at first feel the owner's taste, then create a symbiotic relation with him and suggest the best for a yacht as he should have done for a house. Moreover, the client needs to choice freely objects that will enter his private space. I find childish either the behaviour of the professional persons who take in no account the owner's personality or that of some clients, who let someone influence him. With regard to it's noteworthy that teleshopping of works of art have become very successful today just because people like to buy something freely at home, in their own private space. Does the ethic of a good art consultant be? Of course, first of all a professional art consultant must give neither partisan nor convenient suggestions. Each of us feels different before a work of art and reactions vary from somebody to somebody. If you should make a work "on the road", would you like to do that? No, for all reasons mentioned above. I should offer an owner a range of possibilities and invite him to choose among them. A work of art is like a perfume that doesn't ever like or can't even give the same smell at any change of skin. Is it the reason why great collectors have bought works by unknown artists in the past realizing then they have carried home a fortune at a ridiculously low price? They have irrationally valued and made it by emotions such as certain works give them, on instinct, and they were rewarded for. A professional owner of an art gallery must be loyal to an owner as the captain of his yacht is. I believe in the sentence" honest people are shrewdest people" and I can explain you the reasons why, also from the technical point of view. Unlike many others luxury goods, a work of art appreciates by a right chose. Moreover, it's a moveable property, so a very high - return investment. I mean the client hasn't thrown their money away and this result satisfies me as professional consultant greatly. It's time to end the interview, to leave the gallery with its marvellous works now. While Mr. Contini is showing me a magnificent mid-size Chagall, he says: "Wish it were on board! ", so I ask him: - And. 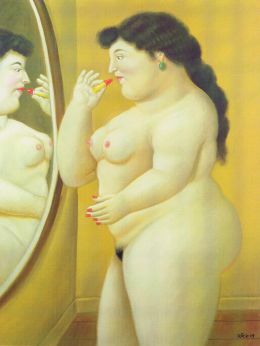 a Botero? - Supreme. 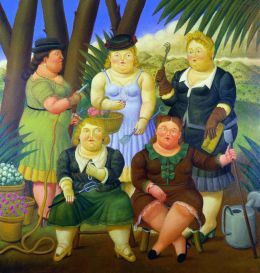 There's actually almost a great Botero's, representing big dressed figures and some women with funny hats among them, which happily sails and ever follows its owner, a famous collector, even at any change of yacht. Also two Mitoraj make atmosphere on board a great sailing yacht sweeping the seas and . they are in great company of three Picasso's.